Authors who write for children are people, too. There’s no logical reason for thinking that people who write children’s books should be any more stable, moral or happy than anyone else. In fact, one of the interesting things about writing this children’s book series for Werewolf has been the realisation that few of the major children’s book writers and illustrators were paragons of emotional stability, or of nuclear family virtue. Like most writers, they tend to have poured their best selves into their work, while inflicting a fair bit of collateral damage on themselves and on others. As we do. Sometimes as with Margaret Wise Brown, who wrote Goodbye Moon, the emotional volatility seems endearing and can inspire protective feelings – at least from a distance. I’d liked to have known Arnold Lobel, William Steig and Garth Williams, while having the reverse hunch about Alan Garner, Ezra Jack Keats, and Susan Cooper – much as I admire their work. George Selden, who wrote The Cricket in Times Square, poses a fairly extreme contrast between the books that he wrote and the life that he apparently led. 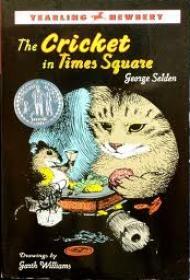 On the one hand, The Cricket in Times Square tells us about the mutual support and friendship between a cricket, a cat and a mouse who are the central players in a story that (almost) belongs in the same league as Charlotte’s Web and Wind in the Willows. Yet can we feel quite the same way about the charming world of Chester the musical cricket and his pals Tucker Mouse and Harry Cat, when we now possess Too Much Information about the author? Let me explain. The Cricket in Times Square was first published in 1960. It transpires that Chester the cricket has a rare musical gift for playing – or chirping – classical music. The cricket becomes the pet of a small Italian-American boy called Mario who works at his parents’ newspaper stand in the Times Square subway station. After many adventures, Chester ends up performing the tenor part from Lucia di Lammermoor to crowds of enthralled New Yorkers – before alas, the pressures of fame get to Chester, and he hops a train back to the peace and quiet of the countryside. The book was a smash success, and Selden eventually wrote several follow up stories, about the exploits of Chester in rural Connecticutt, and about the early life of his big city pals. The plot of Tucker’s Countryside (1969) was even an early piece of conservation activism, as the pals try to cope with property developers who threaten Chester’s rustic enclave. 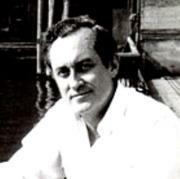 Selden became a successful writer – and he happened to be living in Greenwich Village during the hedonistic heyday of the late 60s/early 70s, before AIDs came along to spoil the party. Plainly, Selden had come quite a long way from his cheery tale of Chester, the little cricket in Times Square. And also from his student days at Yale, and Fulbright scholarship in Rome. Selden did maintain a lifelong interest in archeology – he even wrote biographies of Heinrich Schliemann who re-discovered ancient Troy, and of Sir Arthur Evans, who re-discovered the city of Knossos. Selden died at the age of 60 in 1989, from gastro-intestinal bleeding. Should knowing the subsequent party animal side of George Selden alter one’s impression of The Cricket in Times Square ? In theory, no. Modern readers will find that the book retains much of its charm, despite a few very dated elements. The comic relief provided by the aged Chinese vendor Sai Fong has not worn well – and the Italian mannerisms of Mama and Papa Bellini, who own the news stand at which Chester performs, can also be grating. What has survived intact is the spirit of friendship that was central to the book’s early appeal. Selden writes warmly and convincingly about Chester’s relationship with his friends Tucker Mouse and Harry Cat – two unlikely pals who share a drainpipe together. As Selden points out at one point, New York City is a place where unconventional types can find some degree of tolerance. But I thought, Chester says on page 28 after first seeing the pair together, that cats and mice were supposed to be enemies. “In the country maybe,” Tucker says. “ But in New York, we gave up those old habits long ago.” Unlike most fictional mice, it is refreshing to find that Tucker is also something of a slob around the house. 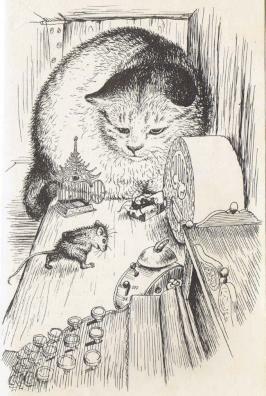 The illustrations by Garth Williams (click to expand them) are the other timeless ingredient, and they helped to propel the book to classic status. 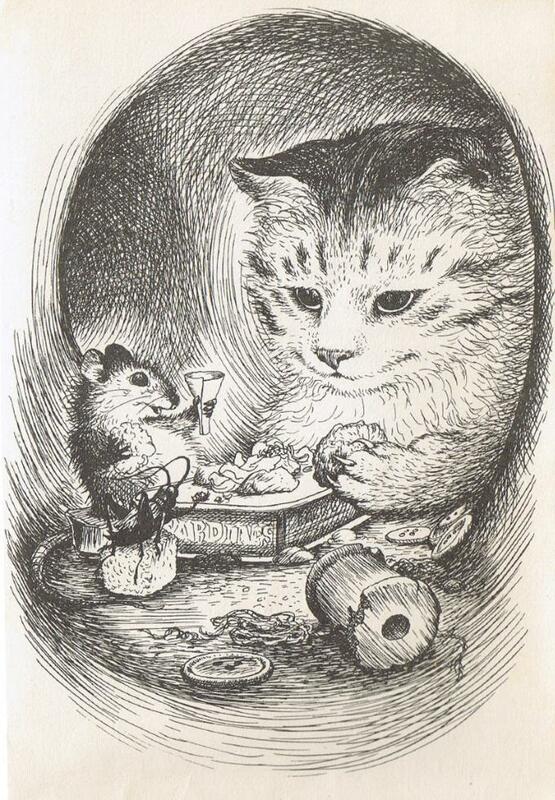 The languidly confident cat and the febrile intensity of the scavenger mouse are both beautifully rendered. The cricket – the straight man in this trio – is hard to draw with any discernible character, so Williams pours his genius into every other facet of the environment. Chester’s playing filled the station. Like ripples around a stone dropped into still water, the circles of silence spread out from the newsstand. And as they people listened, a change came over their faces. Eyes that looked worried grew soft and peaceful; tongues left off chattering, and ears full of the city’s rustling were rested by the cricket’s melody… and what was strangest of all, no one minded. Just this once, in the very heart of the busiest of cities, everyone was perfectly content not to move and hardly to breathe. And for those few minutes while the song lasted,Times Square was as still as a meadow at evening, with the sun streaming in on the people there, and the wind moving among them as if they were only tall blades of grass.. This premise – that music is a universal language and can even transcend species – is a very attractive idea. . It wasn’t an entirely original notion, even in 1960. In 1953 for instance, Stan Freberg had narrated on radio the popular story of Dinky Pinky, an elephant whose beautiful – but somewhat less than manly – high notes eventually earned him a temporary job in a symphony orchestra. All thanks to a discerning music critic very similar to Mr Smedley – the music enthusiast who brings Chester’s talent to public attention in Selden’s book. Just like this writing lark, really.